Notes: These covers are hand made from the finest quality linen textured paper. This first day cover features artwork by the Queen's Scribe, Andrew Jamieson, depicting Richard III mounted on his horse, armoured as a warrior, but holding a sceptre denoting his kingship. 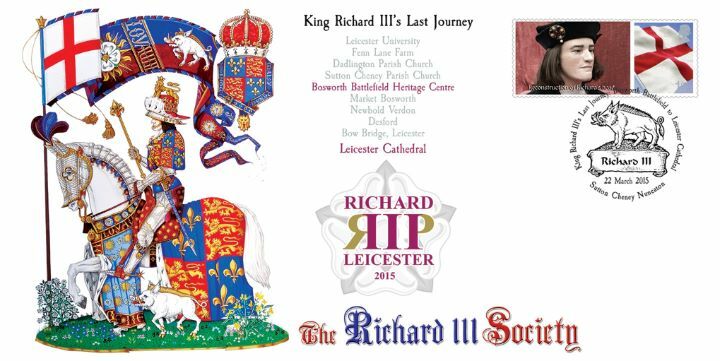 Richard's armorial bearings are shown on the horse trappings and in his banner, while his crowned shield is surrounded by the Garter. Alongside him runs his white boar, while the grass is powdered with forget-me-nots, white roses for York and broom flowers and pods for the Plantagenets. This illustration was specially commissioned by the Richard III Society.